Transplanted wild turkeys are now plentiful in the Upstate - here are some tried-and-true tips for hunting the remote backcountry birds. My father grew up in the shadow of Table Rock mountain, right in the heart of the Jocassee Gorges region. In all his ramblings in the woods and wild places around the area, he can only remember seeing a wild turkey one time. Once, while riding a mule, he saw a flock of five hens near the family's old homeplace. He had never seen such a thing, so he ran back to the house and told his father, who gathered up all the guns in the house and issued them to "all the boys." They quickly dispatched the entire flock. As luck would have it, it happened to be Thanksgiving Day, and several of "the boys" had just returned home from Civilian Conservation Corps camp, so they had their first real Thanksgiving dinner, with turkey, dressing and all the trimmings. That was in 1933. 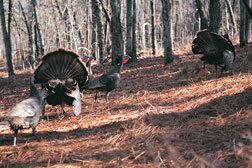 By the late 1960s, the Eastern wild turkey had all but disappeared from the mountains of South Carolina. Sam Stokes, a retired wildlife biologist for the mountain district, had just begun his long career with what is now S.C. Department of Natural Resources, and he took part in the very first attempts to reestablish wild turkeys in the South Carolina mountains. Stokes said the first wild birds were trapped in the Francis Marion Forest near Awendaw and brought up to a 7,000-acre wildlife management area in the mountains of Oconee County. Those first Lowcountry turkeys, snatched from the dead-level flatlands habitat to which they had become accustomed and then released in these rugged mountains, must have thought, "Good Lord. What kind of place is this? We can't live up here. Everywhere you go, it's either straight up or straight down." True enough, the up-and-down terrain is part and parcel of living in the mountains, whether you're a wild turkey or a deer or a bear or a man. But the transplanted turkeys, over time, not only survived in this hilly terrain but actually did quite well. Wild turkeys can now be found in the farthest reaches of the high mountains of South Carolina, even along the precipitous Blue Ridge Escarpment, right along the North Carolina/South Carolina border. Hunting these remote backcountry birds can be a real challenge. Calling a wild turkey into gun range is a challenge anywhere, but in the mountains, you can add one degree of difficulty simply because of the steep slopes. Several years ago, a young archaeologist was assigned to do survey work along the mountain segment of the Palmetto Trail in northern Pickens County. When asked several months later about how she liked working in the mountains, she said, 'Well, I didn't expect it to be so slopey." Slopey, indeed. What a wonderful word. It's so perfectly descriptive. Yep, there are slopes everywhere you go. Steep slopes going up the mountain, and steep slopes going back down the mountain. If you happen to be hunting in an area known as Camp Adger, for example, and you hear a turkey gobbling up in Pig Pen Gap, which is near the top of Pinnacle Mountain, plan on about forty minutes of hard huffing and puffing to get to him. By the time you get there, you will have gained somewhere around 1,000 feet in elevation. If you're not careful and you happen to spook the bird off the roost, he will likely sail out of the tree right down into Camp Adger, where you started. Then you've got to work your way back down the slope. Whereupon the turkey will likely spend the rest of the morning leading you back up the slope to Pig Pen Gap, gobbling all the way. Trust me. It happens. So, how in the world do you go about hunting wild turkeys in the mountains? Well, step one is knowing the woods where you plan to hunt. That's good advice anywhere you hunt turkeys. But two things make that especially true in the mountains. First, turkeys are not randomly distributed in this hilly habitat. In the rest of the Palmetto State, you're apt to run up on a wild turkey just about anywhere. Not so in the mountains. In the spring of the year when turkey season is in full swing, the turkeys will likely be almost exclusively in the big open hardwood hollows, usually on the south side of a mountain. That's where the residual acorns from the previous fall are still buried underneath the leaf litter. It is not uncommon for a flock of wild turkeys in the mountains to spend an entire day in one big hollow scratching around, raking the leaves into windrows as they progress from one side of the hollow to the other. If there happens to be a springhead or a small stream running through the hollow, they may roost there, get up the next morning and do the same thing all over again. So obviously, that's the place you need to be at first light - somewhere above that hollow. It is conventional wisdom among veteran turkey hunters that it's tough to call a turkey downhill. So, if at all possible, you need to be uphill of where he's roosted. If you don't know where these hardwood hollows are, and how to get above them, you've already got two strikes against you. That brings us to the second reason for knowing the woods where you want to hunt: knowing the best way to get there. There is a way to get around in the mountains without much trouble, but it pretty much has to be learned from experience. Most people's first inclination when they attempt to climb a mountain, or even a steep ridge, is to take off like gangbusters right straight up the slope. After all, the shortest distance between two points is a straight line. Right? Well, that may be true in geometry class, but not necessarily in the woods in the mountains. Wild animals almost never climb straight up, or go straight down, a steep slope. If you follow enough deer trails, or bear trails, in the mountains, you will eventually come to realize that wild animals may be dumb, but they're not stupid. They don't waste energy going straight up or even straight down a steep slope. What they do is cut across the slope. It's what old-time mountain hunters call "sidling." You don't climb a slope, you sidle across it. This allows you to gain a little bit of elevation at a time. First you sidle to the left, then you switch across the slope and sidle to the right. Snow skiers do the same thing, except going downhill. In essence, they sidle back and forth across the slopes. Only suicidal maniacs and rubber-boned, twenty-something adrenaline junkies take off straight down a ski slope. Finally, getting lost in the mountains is a real possibility, and one that should be ever present in your mind while chasing wild turkeys from one mountain to the next. Someone once asked Daniel Boone if he had ever been lost. He thought about it for a minute and said, "Well, no, I don't reckon so, but I was bewildered one time for three days." Here's some advice for the "bewildered." If you want to get home for dinner, keep these rules in mind: Skidder trails lead to logging roads. Logging roads lead to gravel roads, and gravel roads lead to paved roads. Paved roads take you home. So, let's say that you think you can handle the terrain, and you've got a GPS, so getting lost should not be a problem, and you still want to hunt wild turkeys in the mountains. Well, let me tell you, it is well worth the extra effort. Few things in the outdoor realm can rival the experience of standing on top of a high mountain at the break of day in the spring of the year, listening to a lusty old gobbler sounding off down in the hollow below. It can be addictive. Nobel prize-winning poet laureate Thomas Stearns Eliot once wrote, "April is the cruelest month." Well, with all respect due a dead poet, and a Nobel prize-winning one at that, he could not have been more wrong. The only thing I can figure is that T.S. Eliot never went turkey hunting in the mountains of South Carolina. Dennis Chastain is a free-lance writer living in Pickens County.